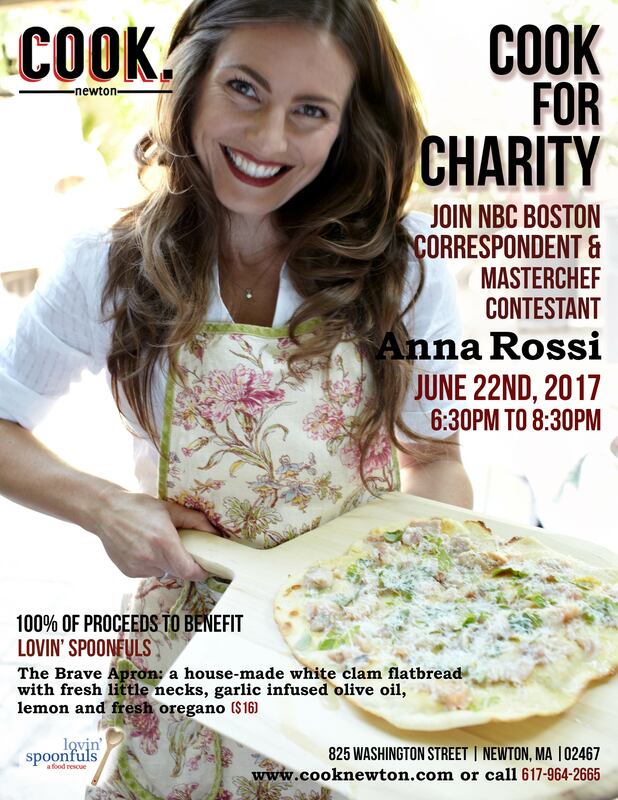 We are welcoming Channel 7 reporter/fill-in anchor Amaka Ubaka as part of our continuing “Cook for Charity” celebrity chef series. 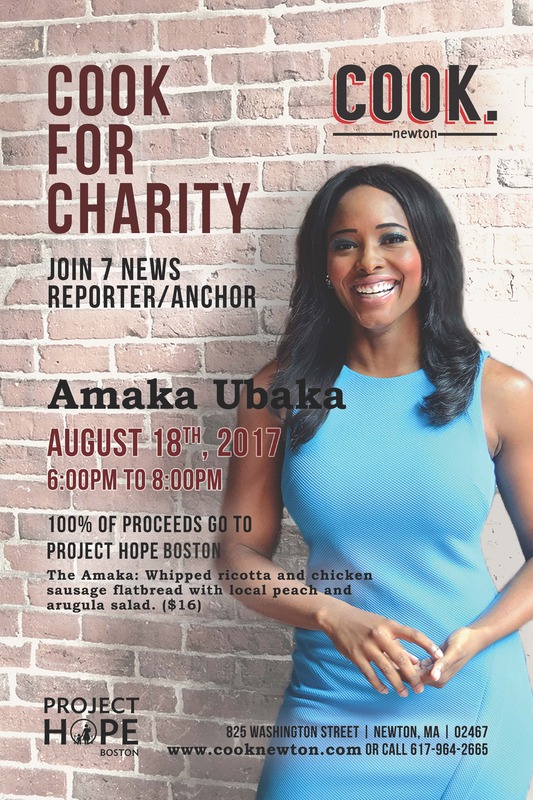 On Friday August 18th, from 6:00PM to 8:00PM, Amaka will roll up her sleeves and get cooking with Executive Chef/Owner Paul Turano to serve specialty flatbreads to benefit Project HOPE Boston! In addition to our signature menu items, Amaka and our kitchen will be serving up “The Amaka” special, a house-made whipped ricotta and chicken sausage flatbread with local peach and arugula salad, $16. 100 percent of sales from each $16 “The Amaka” flatbread will be donated to Project HOPE Boston. Project HOPE Boston is a multi-service agency at the forefront of efforts in Boston to move families up and out of poverty. It provides low-income women with children access to education, jobs, housing, and emergency services; fosters their personal transformation; and works for broader systems change. Prior to working for Channel 7 News, the Tallahassee native worked for WKMG- news 6 in Orlando, FL after graduating from the University of Miami. Amaka has covered several stories that have caught national attention in addition to covering 2012 Olympic swim trials and the NCAA College Baseball World Series. She has worked for several local stations around the country including KRCR ABC 7 in Redding, California and WOWT NBC 6 in Omaha, Nebraska. She joined the Channel 7 News team in May of 2016. This night of cooking is one of several celebrity chef events here, all of which raise money and awareness about a charity chosen by the specific celebrity chef of the evening. The regular menu will also be available that night. 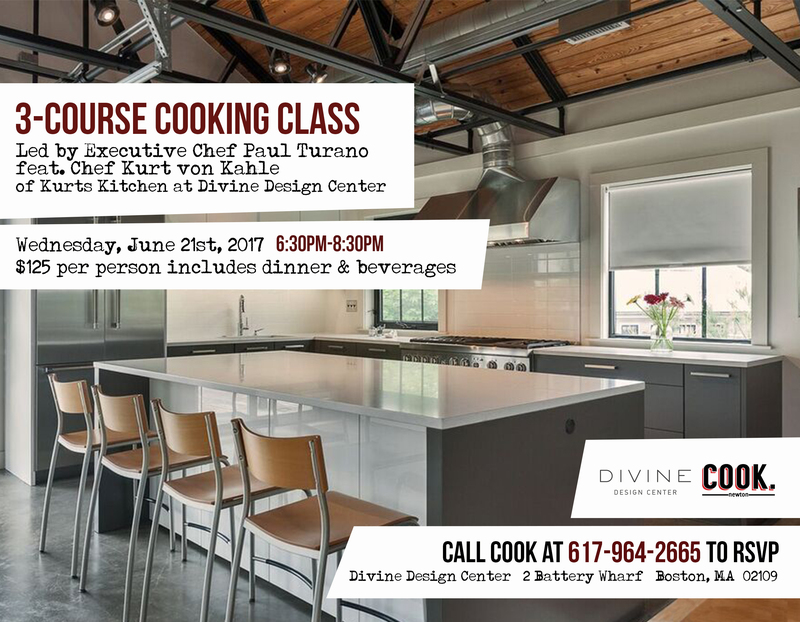 For more information call 617-964-2665. Reservations are recommended. 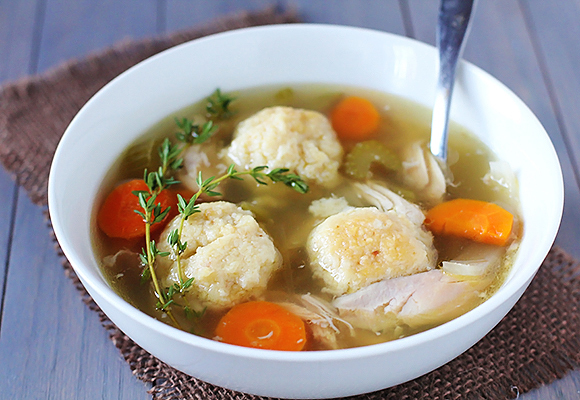 Celebrate the beginning of Passover with our special Passover menu! From April 10th – April 18th, we are offering traditional Seder fare with our own twist. Note: The regular menu will also be available. We’re bringing Bourbon Street to Boston! 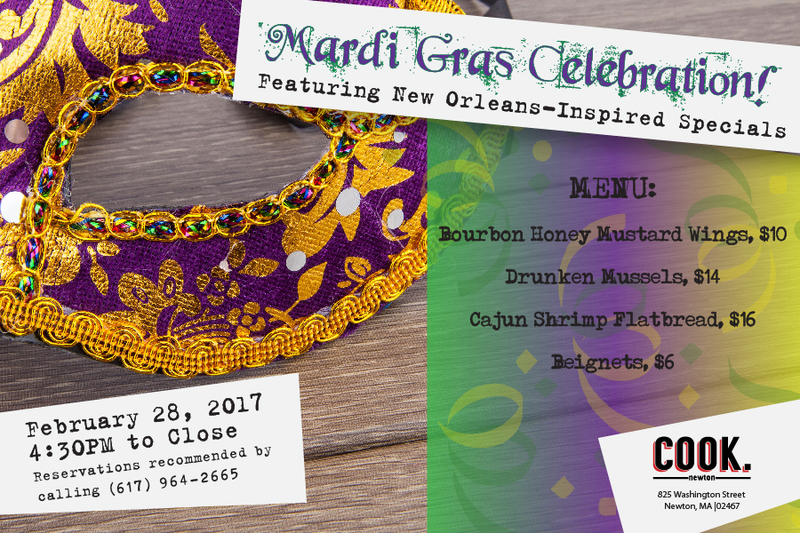 Join us for our Mardi Gras specials inspired by New Orleans’ favorite feast. On Tuesday, February 28th we are expanding our intimate neighborhood vibe to include the carnival’s vibrant energy. You can indulge in small plates like Bourbon Honey Mustard Wings, or feast on flavor-packed entrees like Drunken Mussels made with Andouille Sausage, and a Cajun Shrimp Flatbread with a spicy garlic cream. Sweeten the Mardi Gras meal with an order of house-made Beignets. Toast the night with the Special Fat Tuesday cocktail with Bulleit Rye, Myers Dark Rum and grapefruit. Reservations are recommended. We’ve been cooking up something special for Valentine’s Day! Join us for a full night of romance and romantic specials from February 10th-14th! We are inviting you to a night of charity and celebrity chefs! Join us on Thursday, March 16th, 2017 from 6:30PM to 8:30PM for our continued celebrity chef series “Cook for Charity”. Our celebrity chef for the night is FOX25 anchor Kerry Kavanaugh! Kavanaugh and our own Executive Chef Paul Turano will be serving the “The Kavanaugh Flatbread” to benefit Boston Partners in Education. “The Kavanaugh Flatbread” is made with prosciutto, oven roasted tomatoes, fresh mozzarella, arugula and balsamic glaze. 100 % of sales from each $16 “The Kavanaugh Flatbread” will be donated to Boston Partners in Education. Boston Partners in Education enhances the academic achievement and nurtures the personal growth of Boston’s public school students by providing them with focused, individualized, in-school volunteer support. Kerry is an investigative reporter and the weekend evening anchor for FOX25 News at 6 and 10. A native of Medford, MA, and a Boston College graduate, Kerry has worked across the country covering breaking news. In 2009, the Society of Professional Journalists awarded her first place for consumer reporting in Florida and The Associated Press of Iowa and the Iowa Broadcast News Association honored her series of stories with first place in documentary awards. The Emmy award-nominated broadcast journalist is fluent in Spanish and she loves traveling and trying new restaurants. This night of cooking is one of several celebrity chef events at Cook, all of which raise money and awareness about a charity chosen by the specific celebrity chef of the evening. The regular menu will also be available on the night. Reservations are recommended by calling 617-964-2665. 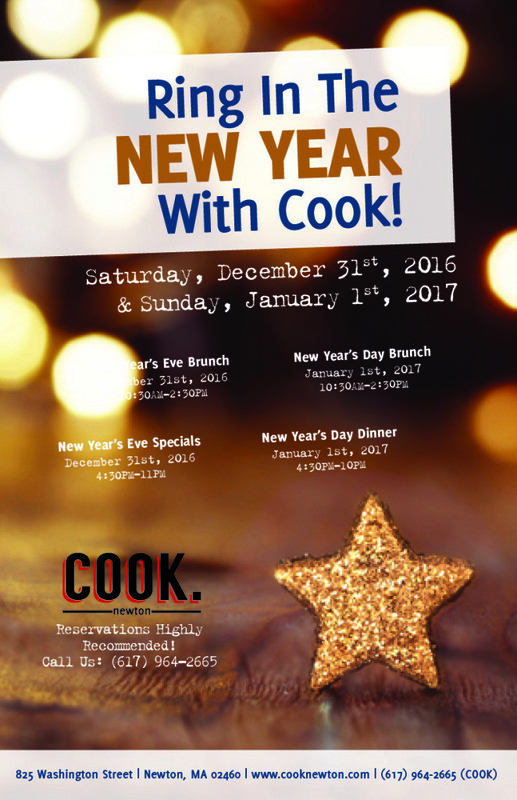 Ring In The New Year With Cook! I am hosting a fundraiser to benefit the Hematology/Oncology family resource program at Boston Children’s Hospital because I want every kid to have the best care possible. The One Mission Resource Room is a center that helps provide services to over 45 families whose children are being treated at the Children’s Hospital Boston Oncology and Hematology Center by offering a space for patients and families to relax and connect with others going through a similar experience. Funded through donations from area businesses and families, The One Mission Resource Room is staffed by a patient and family educator who can help patients and families learn about their medical treatment. Whether the donated money be used for a morning coffee at the local Dunkin Donuts, or towards purchasing a generic American Express donation that can be used towards gas, or parking (daily routines that are often overlooked), each donation will help parents regain a sense of normalcy in their lives. As a thank you, I would like to invite each one of you in to my restaurant. 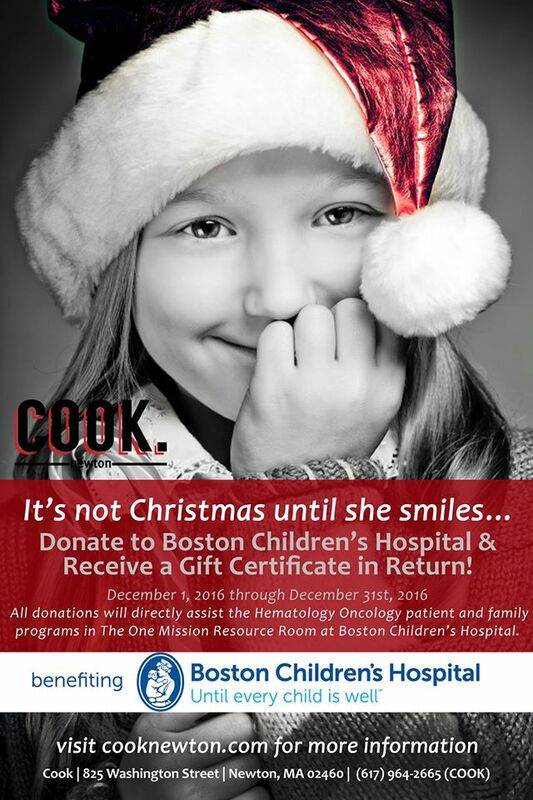 Simply print out your donation confirmation and bring it into Cook so that we can give you a gift card (of up to $20 value) in return. This Thanksgiving, take the stress out of cooking and let us do the work for you! From now through November 22nd, 2016, we are offering a special Grab and Go Gourmet Thanksgiving menu. 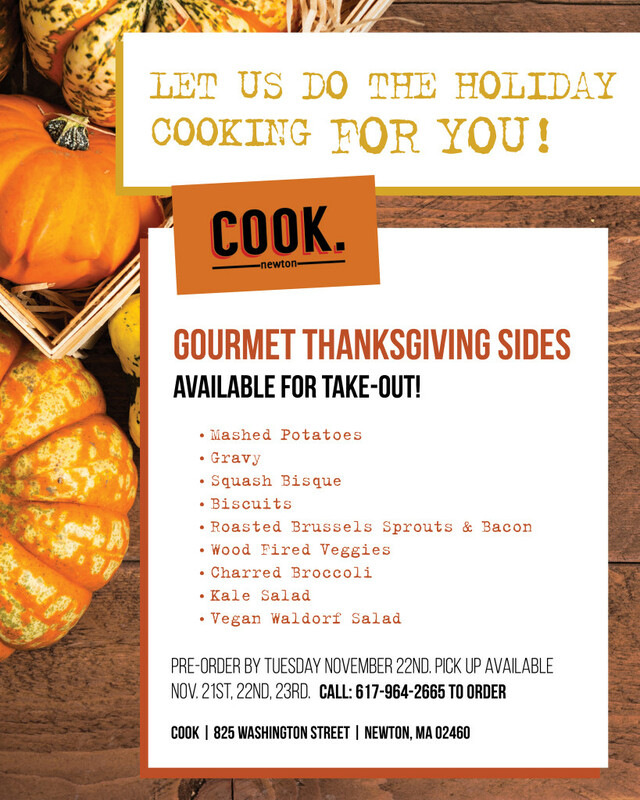 Leading up to Turkey Day, you will be able call ahead and order delicious holiday sides, complete with all the fixings and without any of the trouble. We will be dishing up all the favorites including Roasted Brussels Sprouts & Bacon, Vegan Waldorf Salad, Mashed Potatoes, Gravy, Biscuits, Squash Bisque, Charred Broccoli, Wood Fired Veggies and Kale Salad. Orders must be placed before November 22nd. Orders can be picked up from Monday, November 21st–Wednesday, November 23rd. Orders can be made by calling 617-964-2665. 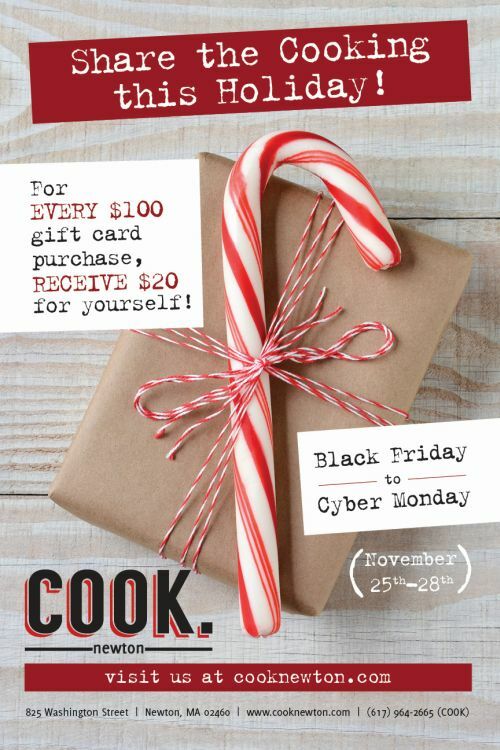 For every $100 gift card purchased, we’ll receive $20 back for yourself!! Valid: November 25th to November 28th!